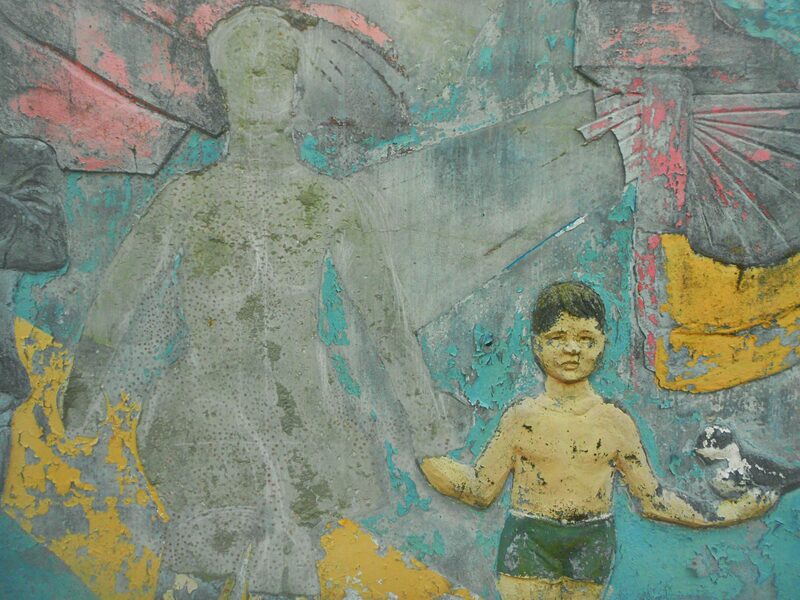 Berlin is a city with a complicated and tragic history. The former capital of the German Empire, the Third Reich, and the DDR (East Germany), Berlin is home to monuments and buildings representative of these different political regimes. However, between 1945 and 1949 (that is between the fall of National Socialism and the establishment of the DDR), it was the Soviet Union that left its footprint in its zone of occupation. 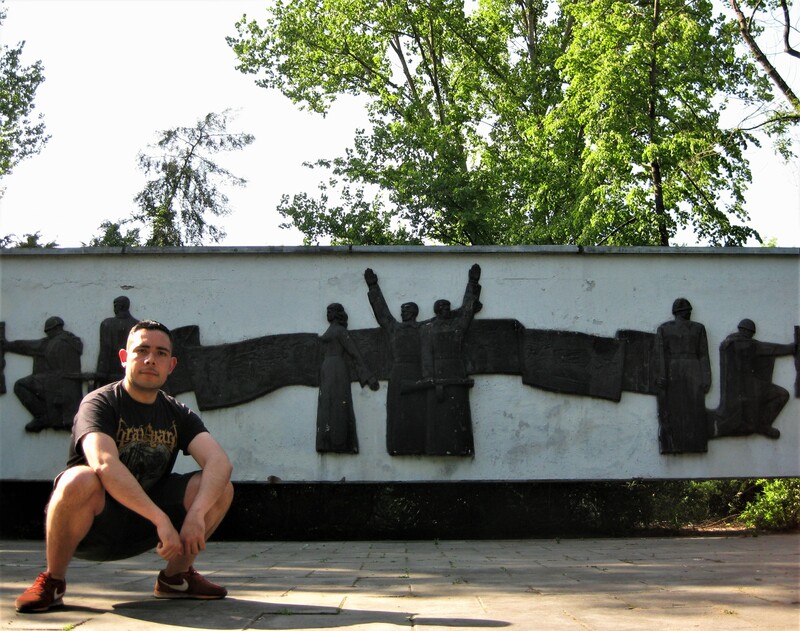 Walk on the trail of the Soviets in the former East Berlin today and you will come across several sites that bear witness to their presence. 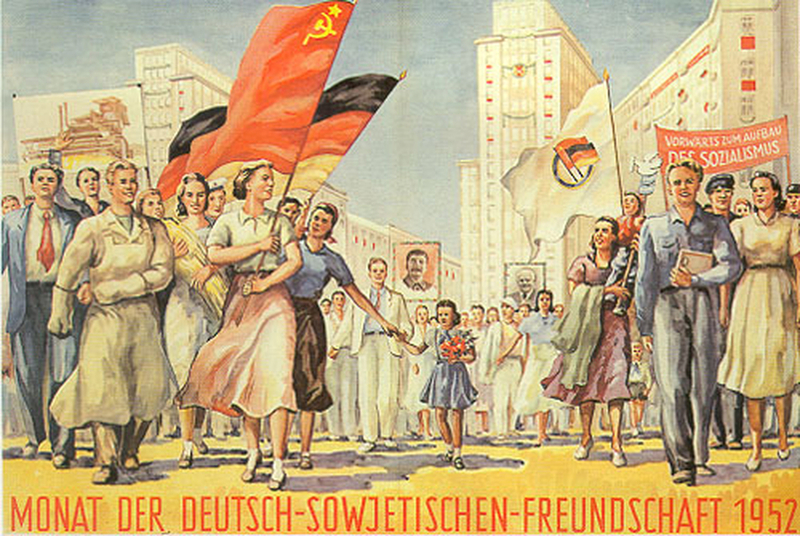 Before the DDR, or East Germany, was established in 1949, the Soviets controlled the territory that was to become the First Workers’ and Peasants’ State—although they did continue to exert their influence in the country until Stalin’s death in 1953. During those years, the Soviet Union went the extra mile to make sure that their presence would not be easily forgotten. 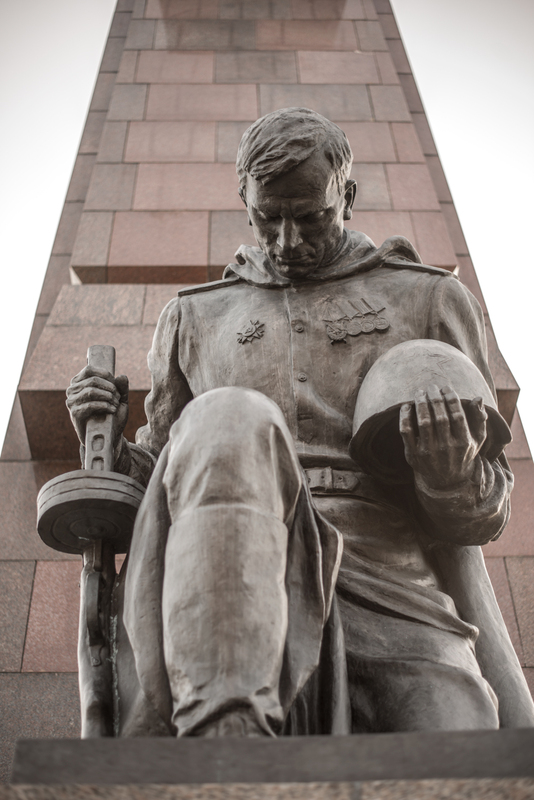 These monuments stand both as a glorious testament to the military might of the Soviet Union, and also as a cold reminder of the temporality of power. Keep in mind that all these memorials were erected by the Soviet Union and not by the East German government. 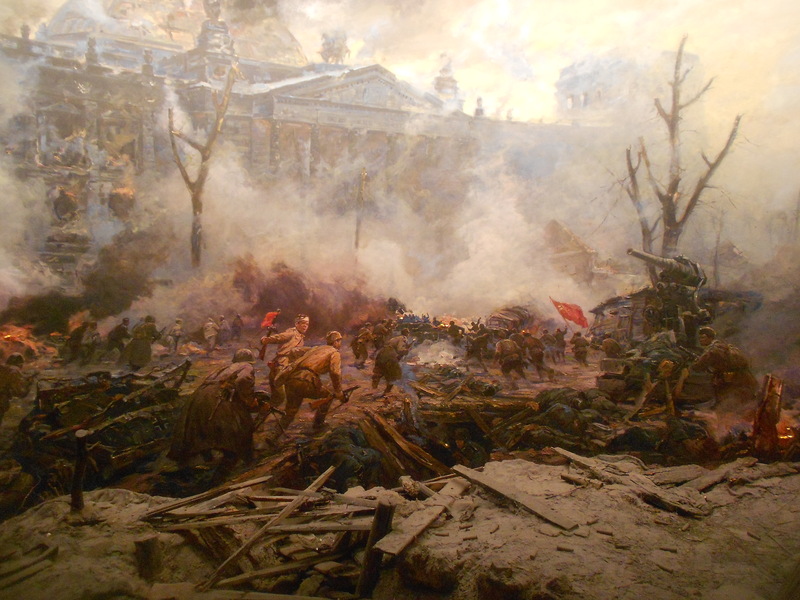 A diorama of the Battle of Berlin at the German-Russian museum in Berlin-Karlshorst. 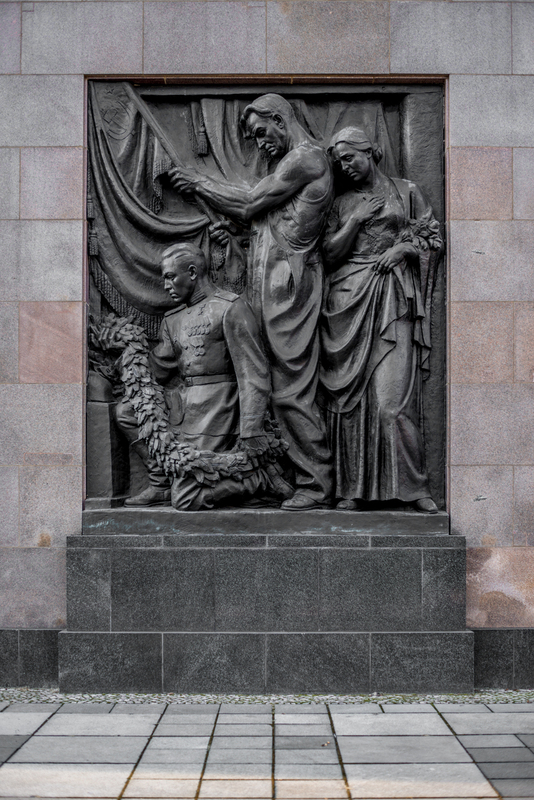 The first Soviet monument commemorating the Red Army’s victory, a lavish war memorial in Berlin-Tiergarten, was commissioned just after the guns had gone silent and was dedicated only a few months afterward—even before the Allies had agreed on the partition of the city. 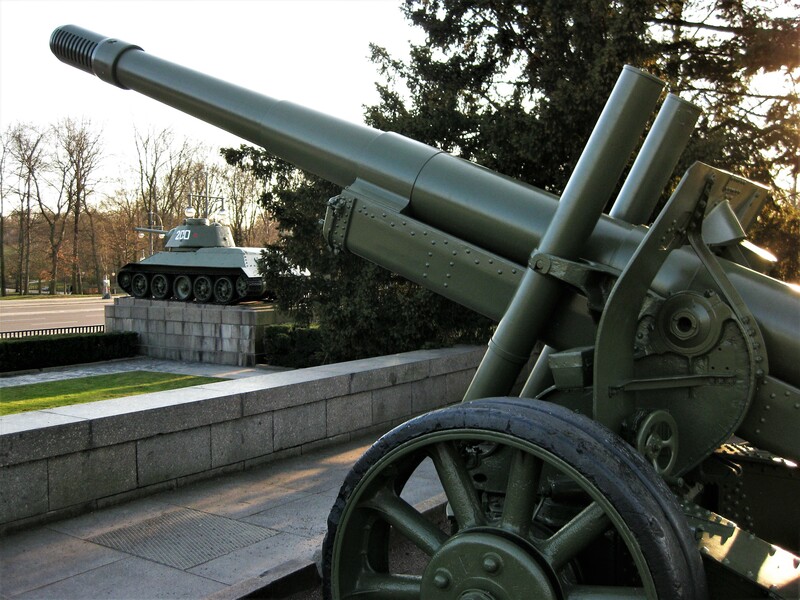 Funnily enough, following the division of Berlin into four zones of occupation, the Soviet war memorial of Tiergarten found itself in the British sector of the city. 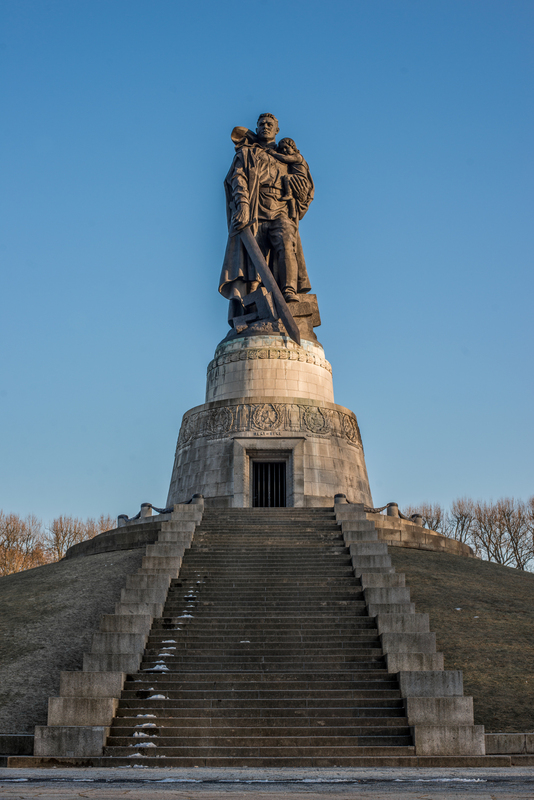 The Soviet War Memorial in Berlin-Tiergarten. 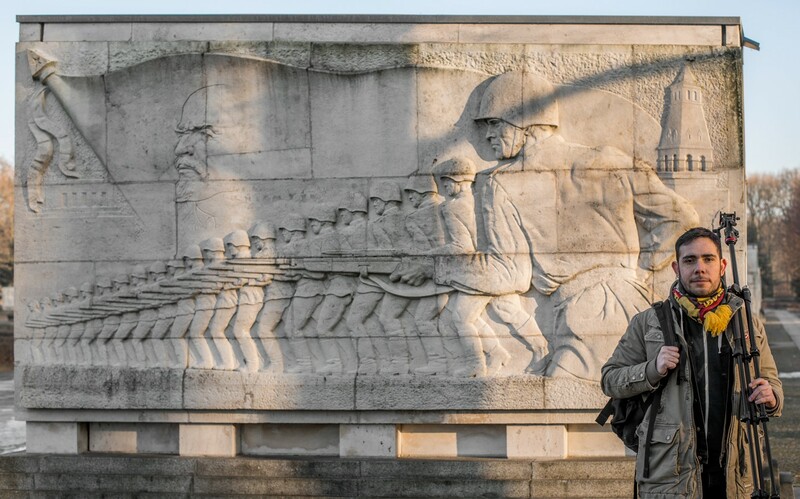 There are two other Soviet War Memorials in the German capital, one in Berlin-Treptow, and another in Berlin-Pankow. 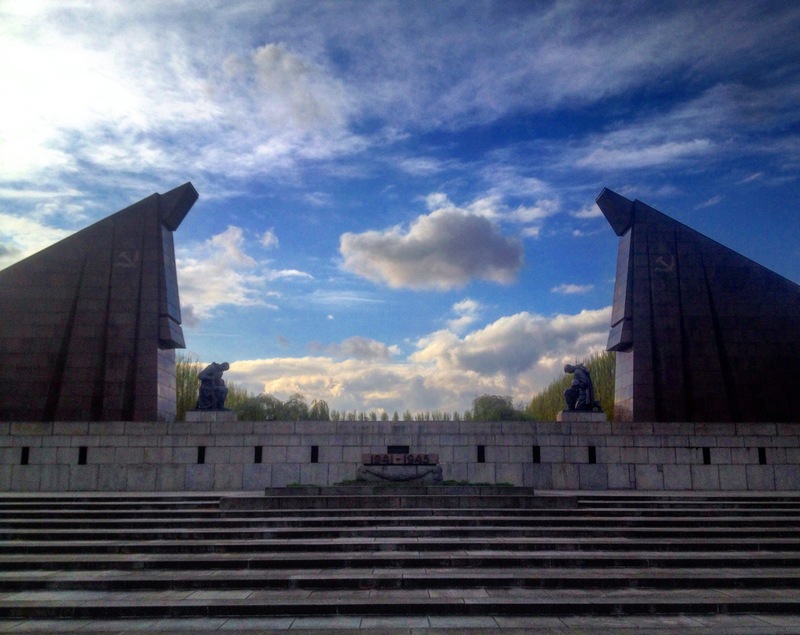 Both monuments were unveiled in 1949 and are built in the Socialist Classicism characteristic the Stalin Era. 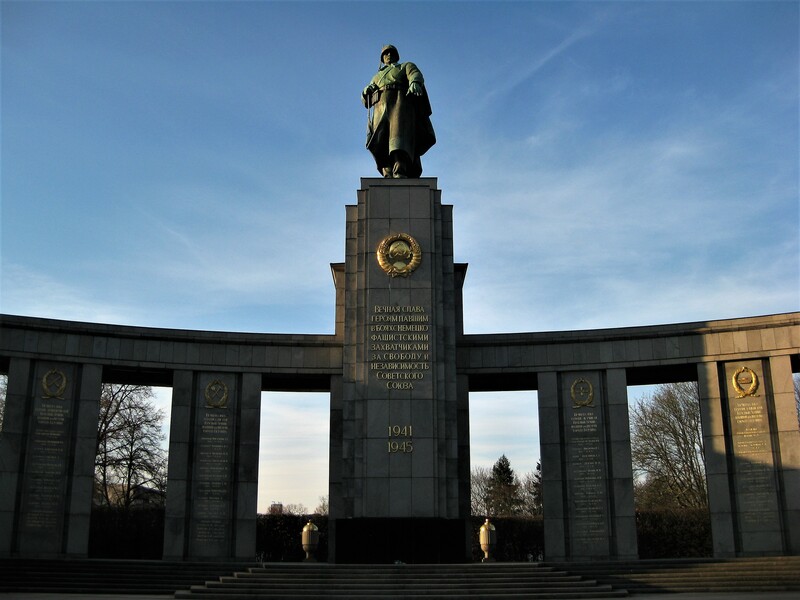 The Soviet War Memorial in Treptower Park has the distinction of being the largest Soviet monument outside of the former Soviet Union, and the one in Pankow is the largest Russian cemetery outside of the borders of the country. 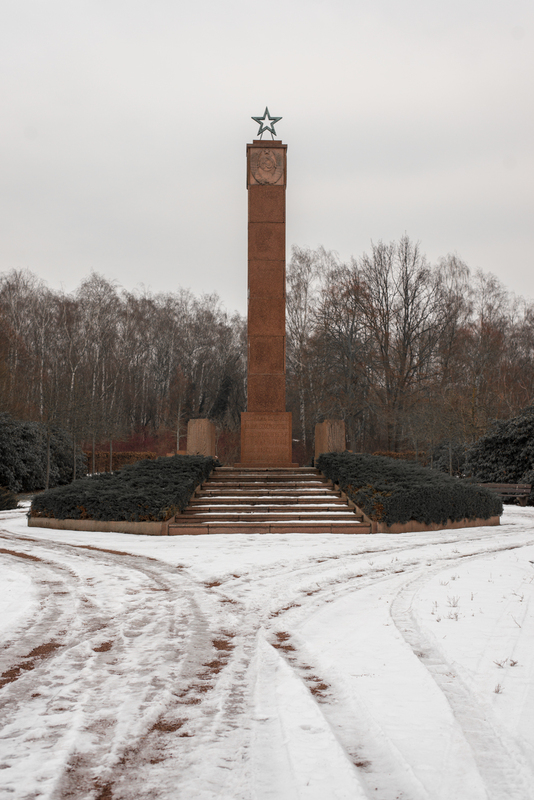 The Soviet War Memorial in Pankow. 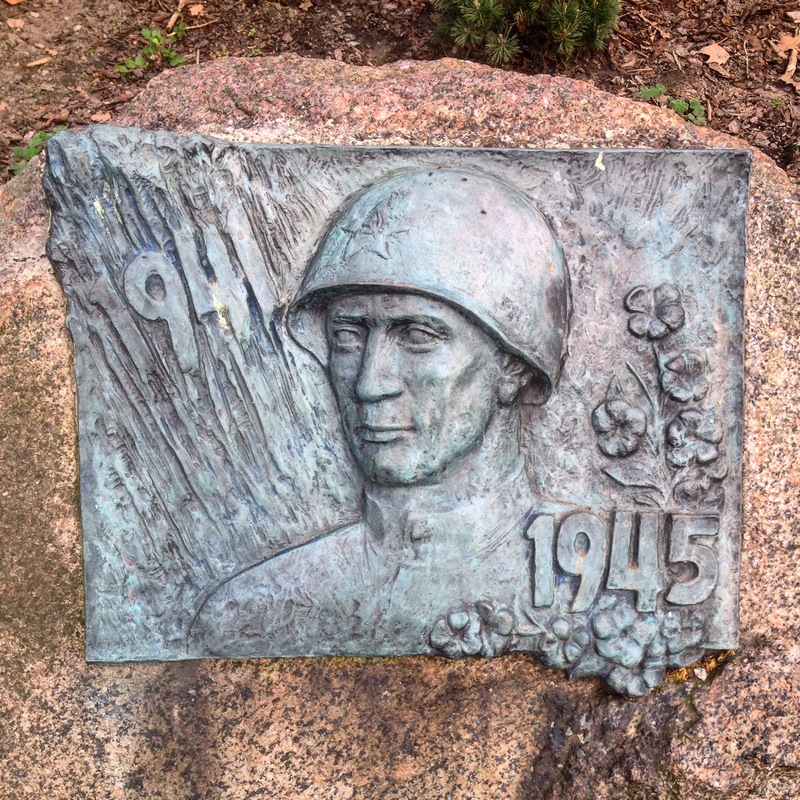 Besides these three monuments, there are little memorials all over town dedicated to the soldiers of the Red Army who died in the Battle of Berlin or during the Great Patriotic War—as the conflict between Nazi Germany and the Soviet Union is known in Soviet/Russian historiography. 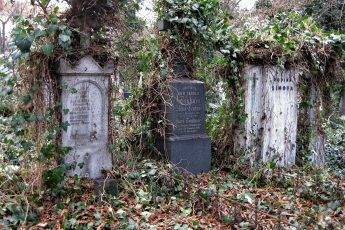 The two smaller monuments below are in East Berlin, the first at the border of Prenzlauer Berg and Weissensee, and the second in Hohenschönhausen. Small memorial in Berlin-Prenzlauer Berg. 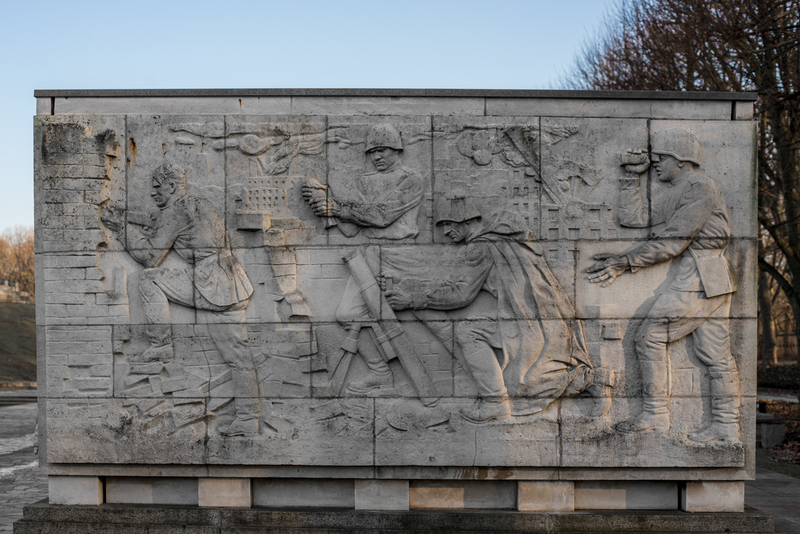 Soviet War Memorial in Berlin-Hohenschönhausen. 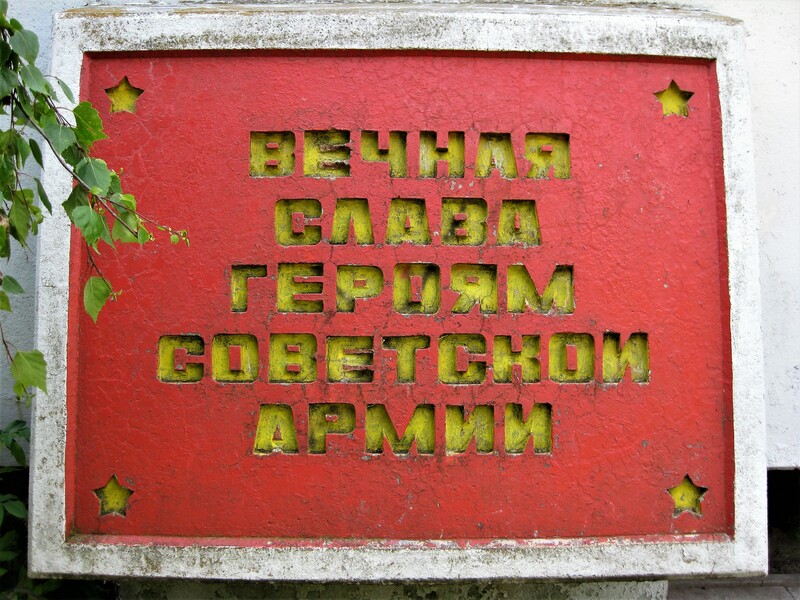 It seems as though the further east one goes, the more remnants of Soviet memory one finds, such as the Soviet monument in the cemetery of Berlin-Marzahn. Also in Marzahn is the (allegedly) first house liberated by the Red Army. 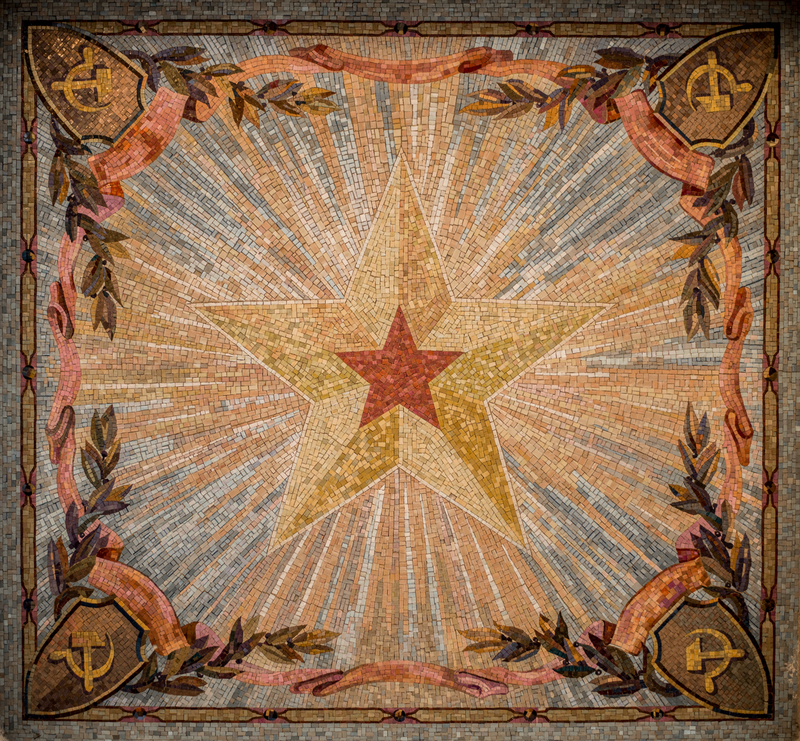 The supremacy of the Red Army was enshrined in these lavish monuments—imposing mementos of a country that no longer exists, in a country that no longer exists, commemorating a victory over a country that also no longer exists. 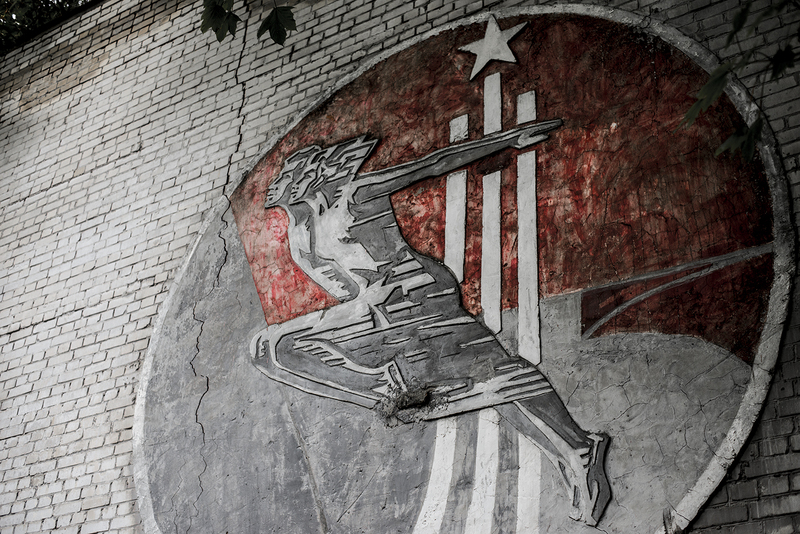 Yet that is the hidden beauty of Soviet monuments. 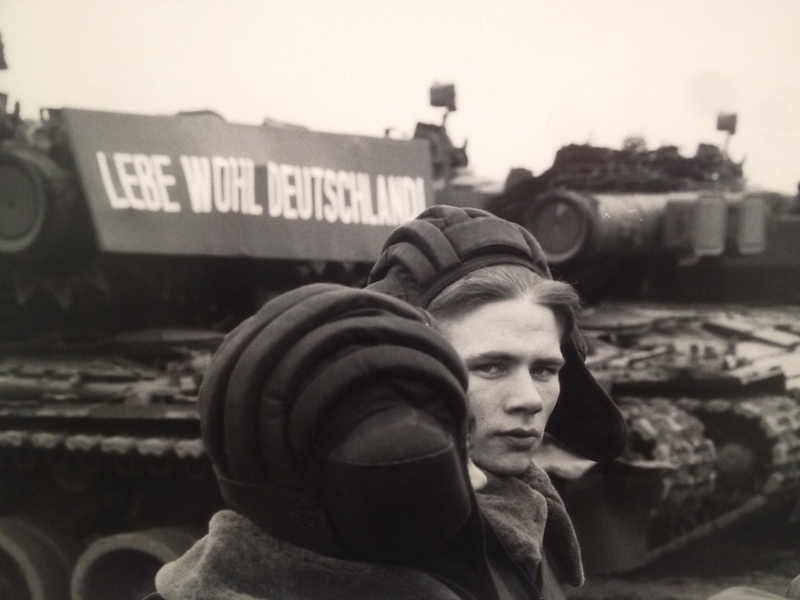 By the time of German reunification in 1990, the Soviet Union maintained a military presence of over 340,000 men and women in the former East Germany. Added to that were roughly 210,00 family members living in around 1550 sites all over the country. 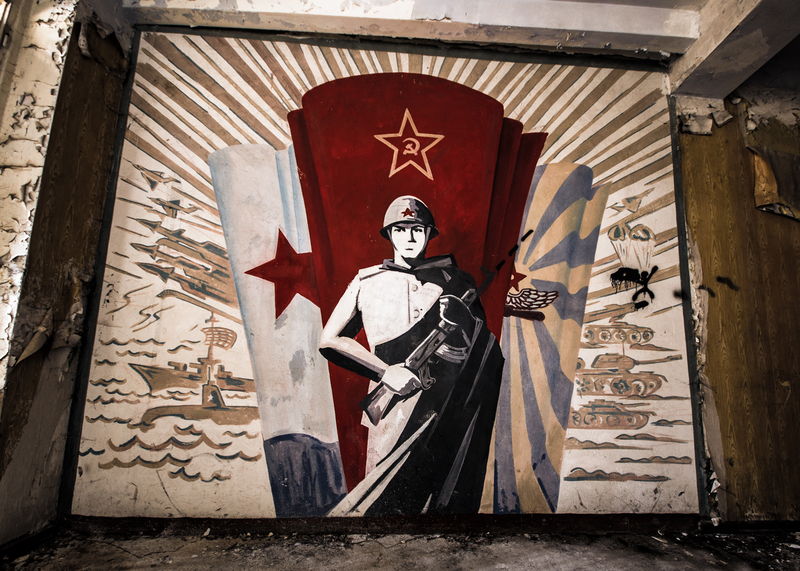 After the dissolution of the Soviet Union, the soldiers of the former Red Army, balancing somewhere in limbo between oblivion and their past glory, were slowly relocated to the Russian Federation. 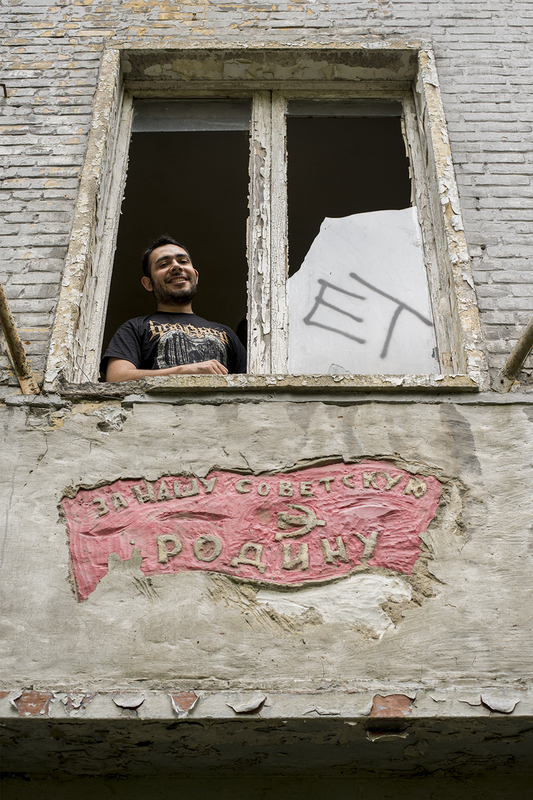 I visited the abandoned bases in Vogelsang, Krampnitz, and Jüterbog to see what is left from those days. 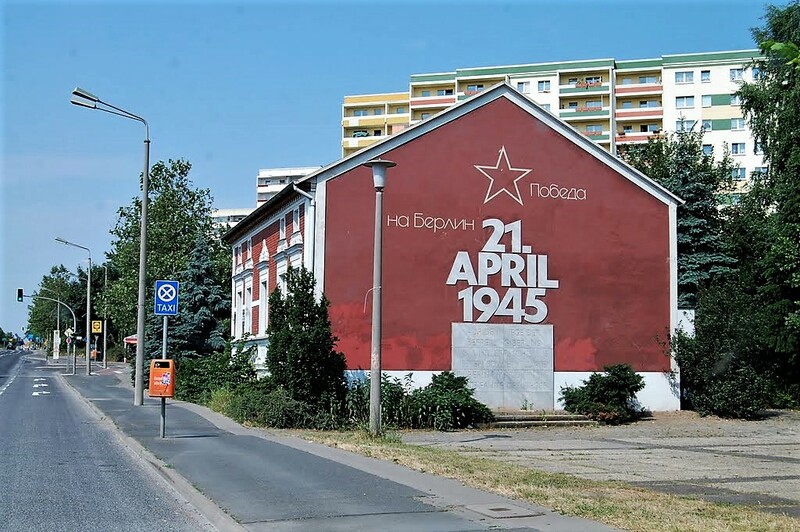 “For our Soviet Motherland!” Decoration in Krampnitz. 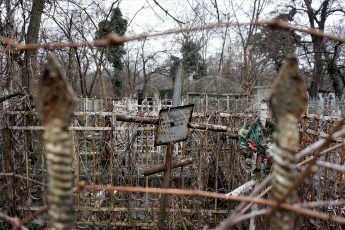 In the wake of their relocation to Russia between 1992 and 1994, the former Soviet army abandoned a host of military bases. Going into these bases today, one can witness just the type of ideological indoctrination that the soldiers were subjected to. 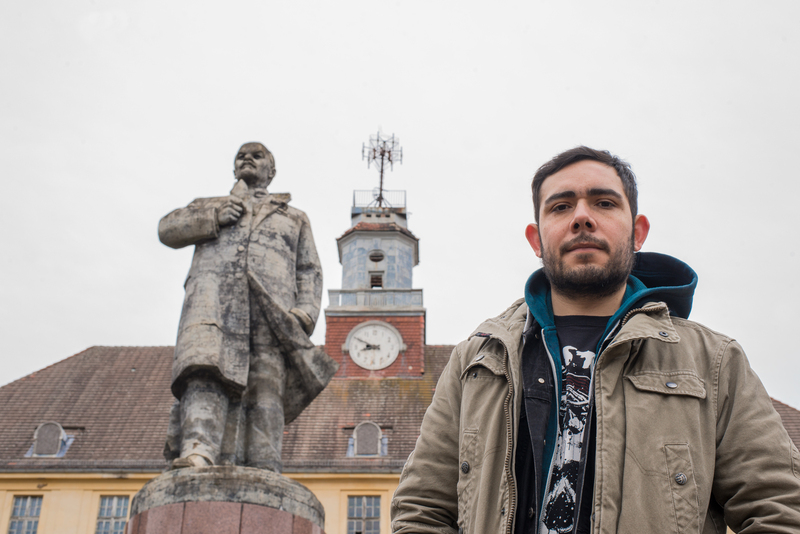 Some of them even offer treats such as one of the very last Lenin statues in Germany. What makes this legacy particularly interesting is the contrast between the heroic portrayal of the Soviet Army and the long list of Soviet war crimes under Stalin—which most Soviet historians and politicians refused to acknowledge. This makes the legacy of the Soviet Army all the more complicated: The Soviet Union under Stalin was responsible for mass deportations, forced labor, and summary executions—with the civilian population of the many countries within its sphere of influence bearing the brunt of Stalin’s policies. 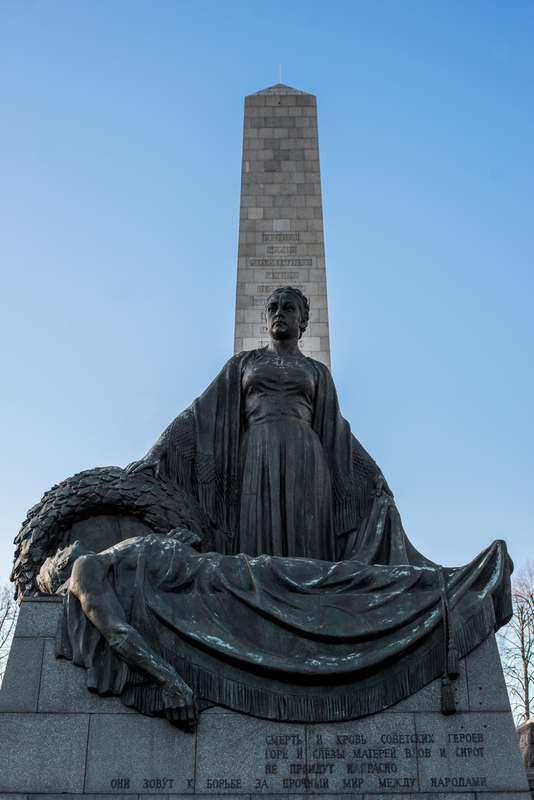 This has made such memorials contentious at times, though the extent of this depends on the historical experience of the particular country. 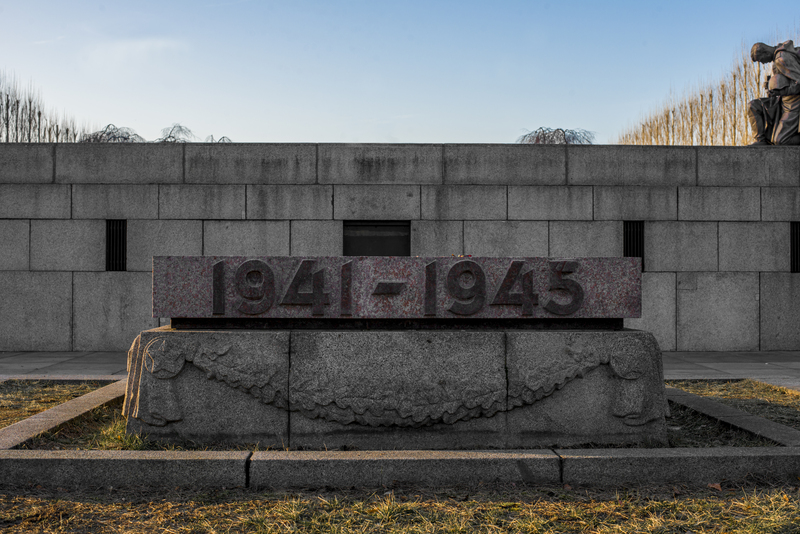 These monuments illustrate a very interesting period of history, and the legacy of the Soviet Army in Berlin is just one of the things that make the German capital so unique. I hope you enjoyed this article. Please help Between Distances grow by liking my page on Facebook and following me on Instagram! Don’t forget to also check out Ruben Kindel Photography on Facebook! You can support the creation of alternative travel content by becoming a patron. Click here to find out how! Should you want to visit any of these memorials and need the exact directions just send me a message or leave a comment down below! “Farewell, Germany!” Pic: Detlev Steinberg. Fantastic blogpost Seb! This is the stuff I like so much, nice photography and history! Looking forward to your new posts! Thanks a lot! Glad I’m not the only one out there that finds this kind of stuff fascinating! Very interesting story (as well as the other blogposts). Enjoyed it very much!